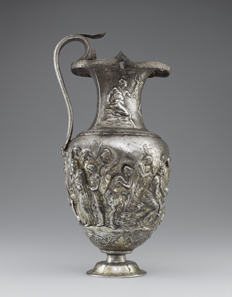 November 29, 2018 – The Institute for the Study of the Ancient World (ISAW) at New York University presents “Devotion and Decadence: The Berthouville Treasure and Roman Luxury from the Bibliothèque Nationale de France”, bringing a spectacular cache of ancient silver, discovered in 1830 in northern France, together with a rich selection of additional Roman luxury objects, all drawn from the unparalleled collections of the Cabinet des Médailles (now the Department of Coins, Medals, and Antiques), of the Bibliothèque nationale de France. 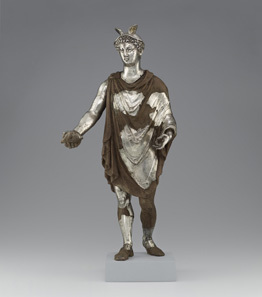 With approximately 160 works, the exhibition will offer insight into the rich cross-cultural exchange that characterized the Roman province of Gaul, as well as the cultural significance of Roman luxury arts. Offering Bowl with Bacchus, Hercules, and Coins. Roman, ca. 210 CE. Rennes-le-Château, France. Gold, 4 cm; Diam. 25 cm. Bibliothèque nationale de France, Paris: Inv. 56.94. Photo: © Bnf. Highlights will include two important silver statuettes of the Roman god Mercury; superbly worked Late Antique missoria (silver platters); drinking cups, offering bowls, and other vessels; cameos; intaglios; jewelry; figurines; and a fragment of a mosaic from Hadrian’s villa in Tivoli. 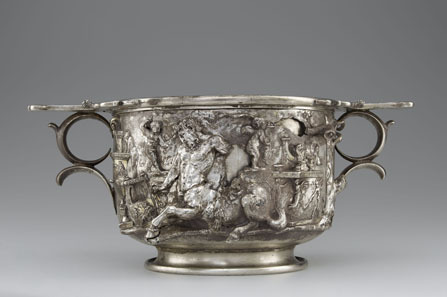 Cup with Centaurs and Cupids. Roman, 1-100 CE. Inscription: “MERCVRIO AVGVSTO Q DOMITIVS TVTVS EX VOTO” (To Augustan Mercury, Quintus Domitius Tutus in fulfillment of a vow). Find-spot: Berthouville, France. Silver and gold, H. 11.7 cm; W. 26.8 cm; D. 17.4 cm. Bibliothèque nationale de France, Paris: Inv. 56.7. Photo: Tahnee Cracchiola © Getty-BnF. Together these and other objects represent some of the greatest surviving achievements of the artisans of the Roman Empire. Devotion and Decadence remains on view through January 6, 2019. The presentation at ISAW concludes the tour, and is thus the last chance for the public to see these exquisite objects before they are returned to Paris. 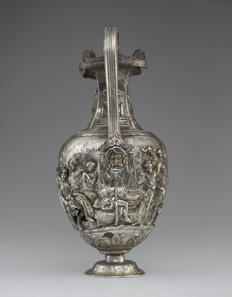 Pitcher with Scenes from the Trojan War of Achilles with Eight Greek Warriors. Weeping over the Body of Patroclus and Priam’s Embassy to Ransom Hector’s Body; Episodes from the Life of Achilles. Roman, 1-100 CE. Inscription: MERCVRIO AVGVSTO Q DOMITIVS TVTVS EX VOTO (To Augustan Mercury, Quintus Domitius Tutus in fulfillment of a vow). Find-spot: Berthouville, France. Silver and gold. H. 29.9 cm; W. 14.5; Circumference. 42 cm. Bibliothèque nationale de France, Paris: inv. 56.4. Photo: Tahnee Cracchiola © Getty-BnF. 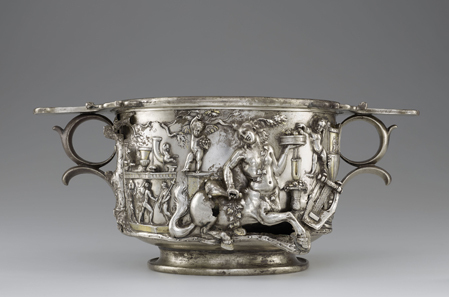 Cup with Centaurs and Cupids. Roman, 1-100 CE. Inscription: MERCVRIO AVGVSTO Q DOMITIVS TVTVS EX VOTO (To Augustan Mercury, Quintus Domitius Tutus in fulfillment of a vow). Findspot: Berthouville, France. Silver and gold. H. 11.7 cm; D. 18.5 cm; Diam. (of rim) 15 cm. Bibliothèque nationale de France, Paris: inv. 56.6. Image: Tahnee Cracchiola © Getty-BnF. Recognized today as one of the finest surviving hoards of ancient Roman silver, the Berthouville Treasure was discovered by a French farmer while plowing his field near the village of Berthouville, in Normandy. The cache – comprising approximately ninety silver and gilt-silver objects dating from the first to third centuries CE – had been buried in a brick-lined pit in antiquity. 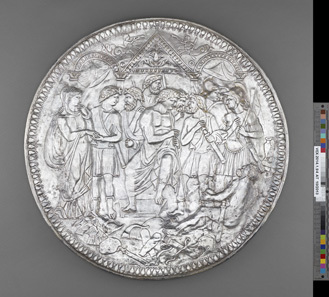 The farmer had originally planned to sell the treasure for the value of its weight in silver, but before he did so, he showed it to a local expert who identified its potential importance and communicated news of the find to Paris, where it was acquired by the Bibliothèque national de France in a bidding war with the Louvre Museum. Subsequent excavations at the site of its discovery, in 1861 and 1896, revealed the foundations of a Gallo-Roman temple dedicated to Mercury Canetonensis. Cup with Masks. Roman, 1-100 CE. Inscription: MERCVRIO AVGVSTO Q DOMITIVS TVTVS EX VOTO (To Augustan Mercury, Quintus Domitius Tutus in fulfillment of a vow). Find-spot: Berthouville, France. Silver. H. 15.8 cm; W. 19 cm; Diam. 13.3 cm. Bibliothèque nationale de France, Paris: inv. 56.9. Photo: Tahnee Cracchiola © Getty-BnF. 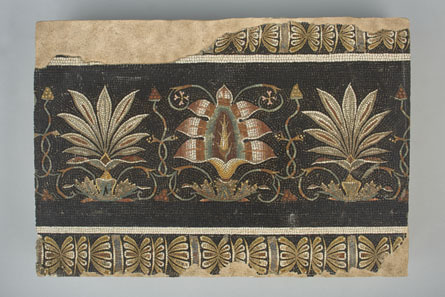 Mosaic with Lotuses and Palmettes. Roman, 125-133 CE. Find-spot: Hadrian’s Villa, Tivoli, Italy. Stone and glass. H. 22.5 cm; L. 32.5 cm. Bibliothèque nationale de France, Paris: inv. 57.261. Image © BnF. “Devotion and Decadence: The Berthouville Treasure and Roman Luxury” is organized in two sections. The first gallery presents the opulent cache from Berthouville in its entirety, offering new insights into Gallo-Roman cultural interaction, as well as art, technology, and religion in the ancient world; the second gallery contains precious gems, jewelry, and other Roman luxury objects from the Cabinet’s collections, opening a window onto the role of such objects in both daily life and religion. Statuette of Mercury. Roman, 175-225 CE. Find-spot: Berthouville, France. Silver and gold. H. 56.3 cm; Diam. 16 cm. Bibliothèque nationale de France, Paris: Inv. 56.1. Photo: Tahnee Cracchiola © Getty-BnF. 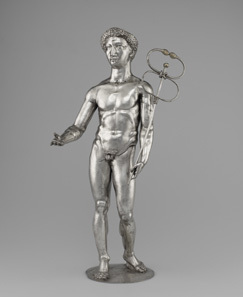 In the first gallery, a Roman statuette of Mercury introduces the importance of the god in Gaul. Dating from 175-225 BCE, this is one of the largest statuettes in precious metal to survive from antiquity. The artist has portrayed Mercury as a beardless young man whose pose and muscular physique, derived from classical Greek statues of the fifth century BC, were popular throughout the Roman period. The messenger of the gods, as well as the patron deity of travelers, shepherds, commerce, and the arts, Mercury was much venerated in Gaul. As Julius Caesar stated in his chronicle of the Gallic War: “Among the gods, they most worship Mercury. … they deem him to have the greatest influence for all money-making and traffic.” Indeed, Berthouville’s location at the intersection of ancient roads and on the frontier between the Seine and the commercial route leading to the British Isles positioned it as a center of pilgrimage and exchange – and asa particularly appropriate site for a sanctuary in this god’s honor. The role of the temple of Mercury Canetonensis as a place where Roman and Gallic cultures interacted is testified to by the presence of objects such as a superb offering bowl that shows Mercury together with either his mother, Maia, or the Gallo-Roman fertility goddess Rosmerta, demonstrating the ways in which their depiction had come to fuse both Gallic and Roman features. Donor inscriptions on silver objects also indicate that the temple was a place where both Roman citizens and Gauls worshipped. For example, a ladle and pitcher are each inscribed with the Gallic names of their donors – Combaromarus and Camulognata respectively – while other artifacts are inscribed with Roman names. Inscriptions additionally reveal that artifacts were dedicated by both men and women, and by ex-slaves and the freeborn. Several of the most lavish votive objects found at the temple to Mercury were offered by a Roman citizen named Quintus Domitius Tutus. 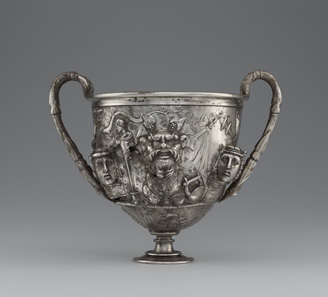 These include cups, pitchers, a ladle, and an offering bowl, all with elaborate ornamentation and gilding that place them among the finest examples of ancient Roman silver that has come down to us through the ages. Most of these feature superbly depicted scenes and iconography related to Bacchus, a god associated with wine and revelry, as seen on a pair of drinking cups known as skyphoi. Bowl with a Medallion Depicting Omphale. Roman, 1-100 CE. Inscribed: “MERCVRIO AVGVSTO Q DOMITIVS TVTVS EX VOTO ” (To Augustan Mercury, Quintus Domitius Tutus in fulfillment of a vow). Find-spot: Berthouville, France. Silver and gold. H. 8.2 cm; Diam. 28.9 cm. Bibliothèque nationale de France, Paris: Inv. 56.11. Photo: Tahnee Cracchiola © Getty-BnF. 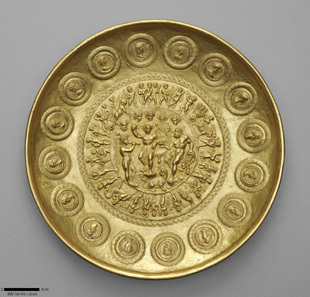 Other examples of elite tableware include a large plate the center of which is occupied by an image of the figure of Omphale, the mythological queen of the kingdom of Lydia, curled up after overindulging. 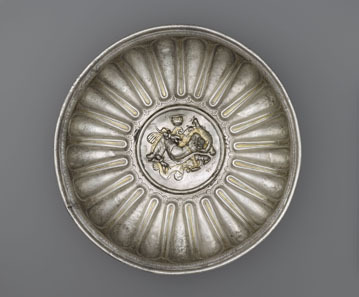 These objects provide vivid examples of the multiple uses and roles of luxury items, which, as seen here, could be transformed from tableware intended for banqueting and revelry into objects offered in gratitude or devotion. Statuette of Mercury with wax support. 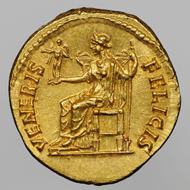 Roman, 100-225 CE. Find-spot: Berthouville, France. Silver and gold; mounted on a nineteenth-century wax support. H. 40.5 cm; W. 17.3 cm; D. 12.5 cm. Bibliothèque nationale de France, Paris: inv. 56.2. Photo: Tahnee Cracchiola © Getty-BnF. Plate with Bird. Roman, 175-225 CE. Inscription: MERCVR AVG SACRVM GERMANISSA VISCARI VSLM (Sacred to Augustan Mercury, Germanissa, the daughter of Viscarus, fulfilled her vow willingly as merited). Find-spot: Berthouville, France. Silver, gold, and niello. H. 3.3 cm; Diam. 28.3 cm. Bibliothèque nationale de France, Paris: inv. 56.24. Image: Tahnee Cracchiola © Getty-BnF. 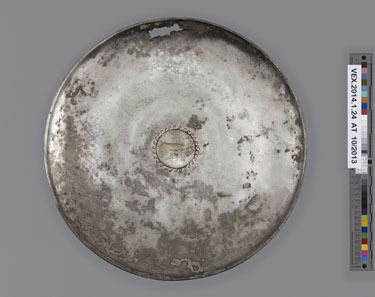 Plate with the Embassy to Achilles (The Shield of Scipio). Roman, 375-400 CE. Find-spot: In the Rhône, near Avignon, France. Silver and gold, diam. 71 cm. Bibliothèque nationale de France, Paris: Inv. 56.344. Photo: © BnF. 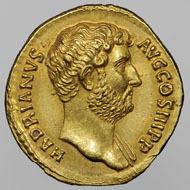 Aureus issued for Sabina, Wife of Hadrian: (obverse) Bust of Hadrian; (reverse) Seated Concordia Holding a Libation Bowl. 129-37 CE. Minted in Rome, RIC III Hadrian 933B. Gold. Bibliothèque nationale de France, Paris: Beistegui 85. Image © BnF. Dated to around 210 CE, this 18th-century find includes jewelry, coins, and an astonishing libation bowl featuring an elegant frieze surrounding a detailed medallion representing the triumph of Bacchus over Hercules. Cameo of Jupiter (The Cameo of Chartres) Set in Fourteenth-Century Mount. Roman, ca. 50 CE. Rome, mounted in Paris. 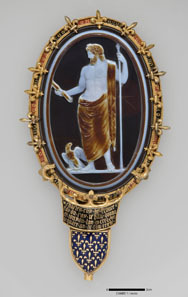 Sardonyx; gold and enamel mount. H. 15.2 cm; L. 6.5 cm. Bibliothèque nationale de France, Paris: Camée.1. Photo: © Bnf. Another masterpiece, the Cameo of Jupiter (The Cameo of Chartres), is notable for both the quality of the sardonyx stone and the stunning detail of its carving. Originally carved around 50 CE, it depicts Jupiter with his scepter and thunderbolt, symbols of his power. It is preserved in a fourteenth-century mount, illustrating how masterpieces of carving were valued and preserved throughout antiquity and the Byzantine period before entering into the imperial treasury. Devotion and Decadence: The Berthouville Treasure and Roman Luxury is made possible by generous support from the Selz Foundation, The Achelis and Bodman Foundation, and the Leon Levy Foundation. Additional funding was provided by Francis Marzio and the Samuel H. Kress Foundation. All works are lent by the Bibliothèque nationale de France, Département des Monnaies, médailles et antiques, Paris. For more information on the Institute for the Study of the Ancient World at New York University go to the institute’s website. On the ISAW website you can also find all details on the exhibition.